QUEZON CITY, Philippines, February 22, 2011 (ENS) – A waste and pollution watchdog organization is rallying public support for a garbage-free Philippines, and President Benigno S. Aquino III is leading an effort to plant 500,000 trees in one hour as the nation celebrates the 25th anniversary of the 1986 People Power Revolution on Friday, February 25. The EcoWaste Coalition is urging all Filipinos to heed its 25 “down-to-earth” garbage prevention and reduction tips called “25@25” in commemoration of the 25th year of the nonviolent people’s action for change. The 1986 People Power Revolution was a series of popular nonviolent revolutions and prayerful street demonstrations involving more than two million people that resulted in the restoration of democracy. The long campaign of civil resistance against the 20-year repressive regime of then President Ferdinand Marcos ended on February 25, 1986, when Marcos fled to Hawaii, conceding the presidency to Corazon Aquino. Most of the demonstrations took place at Epifanio de los Santos Avenue, known by its acronym EDSA, in Quezon City, Metropolitan Manila. Today, the EcoWaste Coalition is advocating “people power” to cut the country’s “mammoth waste size” of nearly 13 million tons annually, close and rehabilitate over a thousand illegal dumpsites and put a stop to littering. “This, we believe, is compatible with the theme of this year’s celebration, ‘I’m a Filipino, I’m the Force of Change,'” he said. “As the force of change, we, the people, can clear our surroundings of trash and get rid of dumpsites which are akin to gaping wounds that should be cleaned, sealed and healed,” said Alvarez. “Despite national and local laws prohibiting and penalizing littering and dumping, the unabashed trashing of our fragile environment persists. By calling for people power against littering, the EcoWaste Coalition hopes that Filipinos, as one people, will reject this dirty habit and rally behind a litter-free Philippines that we all can be proud of,” he said. The country generates some 35,000 tons of waste every day, 12.8 million tons of waste a year, according to the National Solid Waste Management Commission. 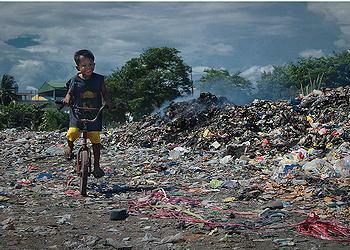 Waste is disposed in 1,172 dumpsites outlawed by Republic Act 9003, the Ecological Solid Waste Management Act. Filipinos need to recognize dumping as a social ill that must be exterminated, regard the habit as distasteful and totally unacceptable, and eradicate the problem by enforcing R.A. 9003 in combination with a public awareness campaign, the EcoWaste Coalition said. The organization is inviting President Benigno Aquino III, also known as Noynoy Aquino or P-Noy, to lead the national cleanup. To mark the anniversary, P-Noy is leading a tree planting activity in Pili, Camarines Sur as part of the El Verde Project 12 million trees in 2012. 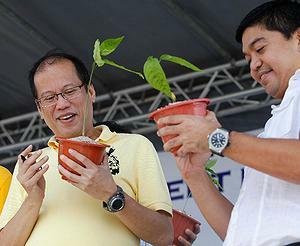 Headed by Governor Luis Raymund Villafuerte, Jr., the El Verde project also aims to plant 500,000 trees simultaneously in one hour. The project is an advocacy campaign spearheaded by the governor dedicated to reversing the rate of deforestation in the province of Camarines Sur, creating awareness and engaging individuals to help save the environment. The campaign covers two cities, 35 municipalities, and 1,036 barangays. More than 10,000 residents will attempt to plant 500,000 trees in one hour on February 23, hoping to place the province in the Guinness Book of World Records and make the Philippines the Green Capital of Asia.